Prepare cake mix according to package directions, adding one teaspoon of the peppermint extract with your wet ingredients. Pour batter into a 9 x 13 casserole dish and bake according to package directions. I baked mine at 350° on the center rack for 25 minutes. It was slightly undercooked so that a toothpick inserted in the center came out mostly clean, which cut down on the hard edges around the outside of the cake. Let cake cool completely on a wire rack. Once cake is cool, wash your hands thoroughly (if it’s been awhile since you started the baking process – you did wash your hands before baking, didn’t you?!?) and dig into the cake. Crumble the cake into rough pieces, discarding any hard edges. We want these cake pops to be like pillows, people. Pour about half of the frosting onto the crumbled cake and mix with your hands. Add additional frosting as needed until cake sticks together easily and feels sticky and moist (this is so totally my favorite part). Once cake and frosting are mixed, take a tablespoon and scoop out rounded spoonfuls of cake. (Note: every cake pop recipe I’ve seen says to use a two-tablespoon measure, but this made my cake pops come out HUGE, as you can see below, and not at all like the dainty two-bite confections at Starbucks. You can use a bigger scoop if you want, but I prefer to be left wanting another after eating a cake pop, as opposed to barely being able to finish my first.) 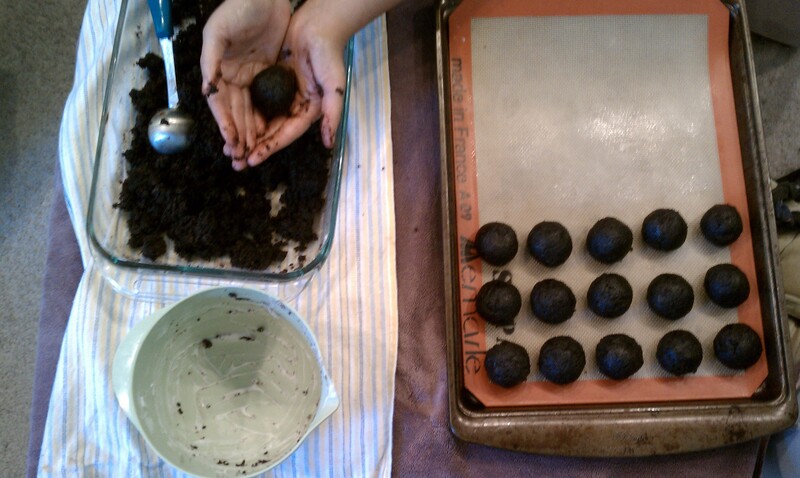 Mold cake into spheres with your hands and set them on a cookie sheet lined with parchment paper or a Silpat. Once you’ve molded all the cake into balls, put the cookie sheet into the refrigerator for at least an hour to let them firm up and chill. This will help the candy coating set later on. Since I was making these the day before and didn’t want to coat them yet, I put mine in the freezer overnight and they turned out fine. Place unwrapped candy canes in a food processor and crush, or stick ’em in a ziplock bag and pound with any heavy object you can find. I found that when I ran my crushed candy through a mesh sieve I ended up with candy chunks and candy dust – both of which I dipped my pops in – resulting in fun, varied textures. Melt candy coating according to package directions. If using white chocolate, combine chocolate, food coloring, and a teaspoon of vegetable oil in a microwave-safe dish and heat at 30 second intervals, stirring in between, until coating is smooth and drips easily off your spoon (you may need to add more oil to get the right consistency). Skewer a cold cake ball with a lollipop stick (I found mine, along with the pink candy coating disks, at Diddams). 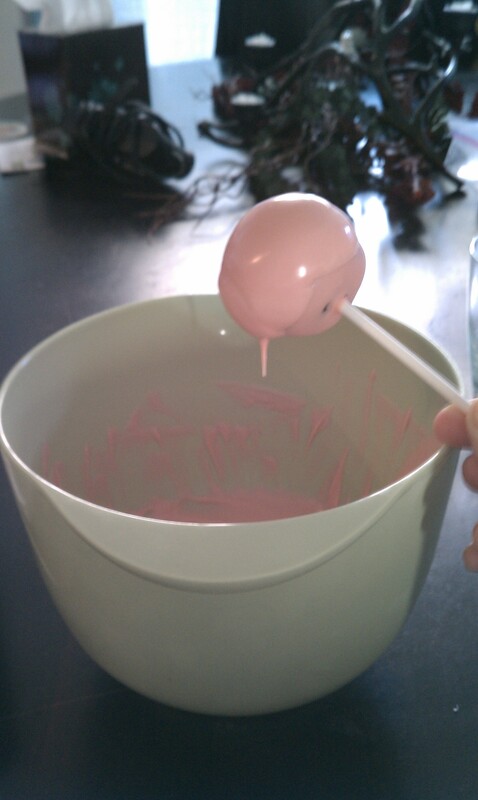 Dip ball into melted candy coating, turning so that it is completely covered. 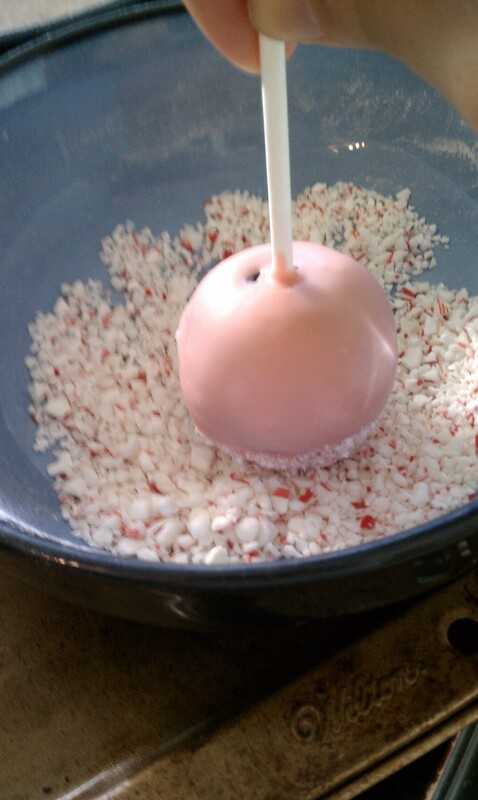 Tap excess coating off of the ball and quickly dip into crushed candy canes. I have no inappropriate rap lyrics for this one, guys. Sorry. You’ll have to work quickly, or risk having to reheat candy coating and adjust the texture with oil. 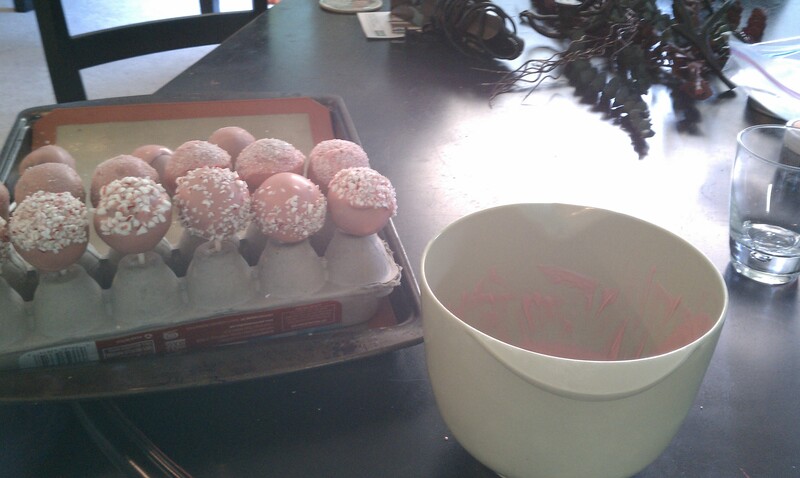 Repeat coating and dipping process with all your cake balls, and voila! Peppermint chocolate cake pops! You can put your pops upside down on cupcake papers to set, or do what I did and poke holes in the bottom of an egg carton. This was also how I presented them to our home group. I thought about getting all fancy with a glass container and arranging them like flowers, but then I thought ‘meh.’ People were equally impressed with my clever repurposing of an egg carton, believe me. So I hope you enjoy! 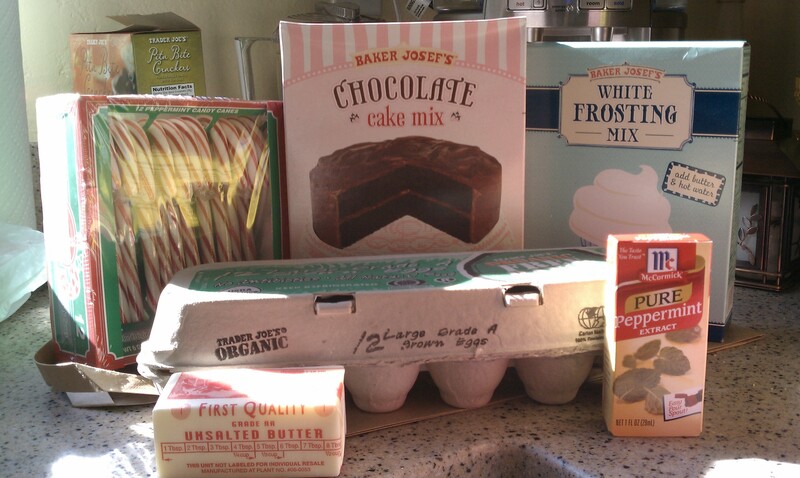 If you make any of your own, or have a favorite cake pop recipe to share, leave me a comment and let me know! *Apparently my desire for cake pops makes me talk like a cowboy now. Mosey. These parts. What’s wrong with me? ← Two Doggy Tales, or How Can Such a Smart Dog Be So Stupid?